Metro Pro is an awesome responsive WordPress modern magazine theme from StudioPress club. 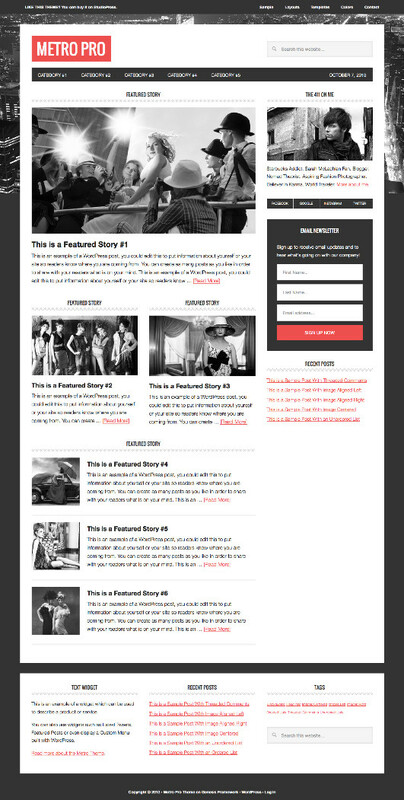 This theme is specially designed to showcase heavy content-based websites like news/magazine websites. It has been well coded and optimized for search engines with the fast loading user experience. Metro Pro WordPress Theme has been built on Genesis Framework, which gives you plenty of features like theme options, preset custom styles, drag-n-drop widgets for the simple hook, tabbed widgets, social media sharing options, pre-built page templates and etc. Responsive design – Mobile ready!